My “Friends” we are surely “Possiblitarians”. I enjoy the positive messages Dr. Norman Vincent Peale provided over the years. He encouraged “raising our sights and see possibilities-always see them for they’re always there.” The Learning Center along with “Friends” represent the thinking and imagination of “Possiblitarians”. You being a “Friend”, qualifies you as such. This week the Learning Center is primarily under the control of both Marguerite and Markki, last year’s volunteers, during Angela’s absence for a couple of weeks. Both have returned to pick up where they left off. They bring back their awareness of the community, the parents, and certainly the students, allowing for teaching to resume with very little change. I promised last week to introduce you to the college students who will be traveling to the Copey Learning Center in May. Both students represent the Emory & Henry College’s (E&H) Bonner Scholar Program. The Bonner Scholars are part of a program through the Corella & Bertram F. Bonner Foundation, which provides around 1500 students at over 27 colleges and universities with scholarships in exchange for their commitment to community service and activism. Casey Heinlein is our featured E&H College student this week who has been selected to provide community service as a volunteer at the Learning Center. There is little question why Casey is one of the two selected volunteers. She claims Winchester, Virginia as her hometown and will be entering her junior year when she travels to Copey in May. Casey is majoring in Civic Innovation and Religion with a minor in Mathematics. She is very active as a student volunteer on and off campus with various groups and organizations. Her plans immediately after graduation in a couple years are not certain, but she believes her long term goal includes having a summer service camp for children, youth, and adults where they each can learn about serving with others and serving for others. Casey attends this college. Also, it is this same culture which in partnership with “Friends”, will be the first college in the USA to bring Angela and two of its top students from the Learning Center to its college campus in June. Therefore, my pride runs deep for Casey who is demonstrating a tremendous generosity of her time, sharing of her talents, and expending her personal resources. My pride also runs deep for the college and for its affiliation with the Bonner Scholar Program which supports this type of student volunteer service. Next week, I look forward to introducing you to our second E&H College student, Xavier Marshall, who will be joining Casey at the Learning Center. Lisa Baldwin commented on last week’s Post regarding our story on the young Copey 15 year old student Celeste. Lisa said, “WOW! Celeste’s words and writing are amazing. The students at Emory & Henry will certainly learn a lot from her. What an amazing opportunity for all involved.” Lisa expresses the same sentiments many of us share as we look forward to Celeste, Noelia, and Angela arriving on the E&H College campus in June. Progress is being made but remains slow. We have Plan B being put in place now to help us raise the final $350 and get us over the finish line. We have yet to fail to meet our financial commitments to the Learning Center. This goal will be met. More info on this next week. Last week, I shared some information about Noelia, our Learning Center student who is heading to Emory & Henry College in June. I promised to introduce you to the second Learning Center student who will also be traveling with Noelia and Angela in June. Please meet 15 year old Celeste Ulloa Mora. She has been a student at the Learning Center for four years. She is extremely excited being the second of two selected candidates to make this journey. Similar to Noelia, Celeste is very strong academically and does extremely well in other activities. She has participated in gymnastics, band, speech, and theater to mention only a few of her many student activities. Below are Celeste’s own words explaining why she wanted to be selected for this wonderful opportunity to travel to the USA and attend the Scholars Leadership course at Emory & Henry College in June. I share the entire text with you to point out her growth and development in learning English. The importance of the Learning Center is on display here as it points out the fact this report written in English from Celeste would not have been possible without being enrolled in the Learning Center. The positive impact the education is providing is astounding and with a couple more years of English, she will do extremely well. I also share the full text to illustrate how positive Celeste is regarding her upcoming role as an Ambassador. She will be a huge hit in the USA and when she returns home, she will be equally significant as a source of inspiration for other Learning Center students. You can contact me using the information below. Today is a very special day as it marks the start of another year for local students in Copey. The Learning Center and the “Friends of Copey” are beginning the third year of this vey unique partnership. A large number of the students will be at the Learning Center today because of you. Markki, second year volunteer, is shown with kindergarten students on the opening day. Just look at those smiling faces! This is a new beginning for them…a year of both hope and promise and we are very excited to be such an important part of it all. competitive selection process, Noelia is one of two students who will be traveling to Emory & Henry College in June, 2016. She will be attending the Summer Scholars Program. Noelia is an excellent student with aspirations to continue her studies at a Costa Rican school following graduation. She has expressed her desire to one day become an English teacher. Together with her academics, she is well known for her athletic skills. She has participated at the national championship level playing handball and participating in rhythmic gymnastics. She has excelled in other sports including swimming, soccer, volleyball, and ballet. Next week’s Post will highlight the second equally dynamic student from the Learning Center who will join Noelia on the trip to Emory & Henry College in June. We continue to make progress although the donations have certainly slowed down. This also happened last year and resulted in the “Big Parking Lot Sale”. Although we have only a short way to go, we may still need a fundraiser to reach our goal. Please know we are still accepting large and small donations to keep the ED position funded and our progress and plans cemented for the year. Instructions for donating are provided in the last Post or call or write me for assistance. Certainly, by now you are aware of our most recent achievement. The Anne G. Broady Scholarship Goal was met before the deadline because of a number of very generous donors. 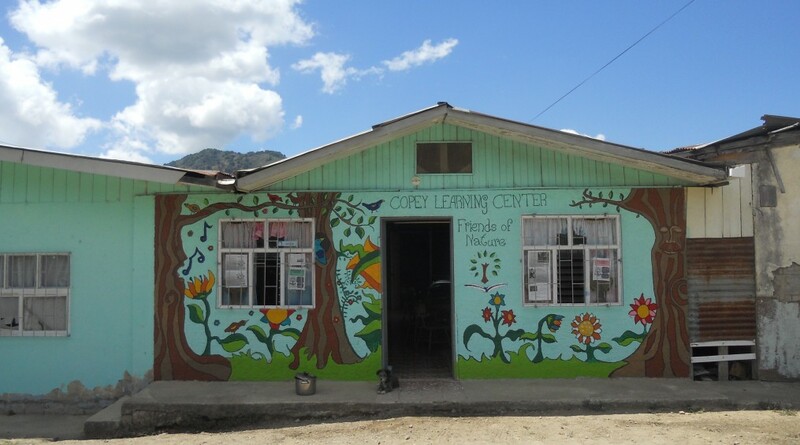 Because of you, several enthusiastic students will be showing up at the Learning Center to learn English thanks to “Friends of Copey”. The Anne G. Broady Scholarship Fund VICTORY IS SWEET! HAPPY BIRTHDAY! to AGB Scholarship Fund Co-Chair Dr. Franklin Church. Thank you for sharing this journey and being such a dedicated supporter. “Friends” could not make it without your support. Now, we are still busy with our second fundraising campaign to help support the funding for the Executive Director’s position. We are doing very well so far but need additional donations/pledges. We still have some distance to go to reach our goal. Why is the ED position important? We know an organization striving to be successful planning for their growth and development must have leadership that is competent, strong, and committed. “Friends” agreed in 2015 to support the Learning Center’s decision to establish its first and only paid position, the Executive Director’s position. The results of this decision after its first year are very positive. A full list of all the 2015 achievements both “Friends” and the Learning Center can proclaim have already been cited in previous Posts. We now have 2016 plans in place to continue moving forward with new goals and high expectations for the students attending the Learning Center. allowing two Copey students including Angela to travel to E&H College in June is convincing evidence for what can be done when there is strong and competent leadership in the position of Executive Director. We look forward to June when our special guests will walk among other students on the E&H campus. The “opportunity” is now and knocking on our door…without an appointment! Methods for Donating are still the same. If you wish to support the ED Position…the two methods for donating are the same as last year and for the AGB Scholarship Fund. The Learning Center’s PayPal can be used to make donations directly. Please access the PayPal system by clicking on….http://copeylearningcenter.org/. Find the PayPal logo in the upper right hand corner of their homepage. To make certain the Learning Center recognizes your donation and how it should be applied, indicate in the comment section that the donation supports the “EDF” (Executive Director Fund). Please contact me if either method needs further explanation. The majority of the donors have used the second method without any problems or concerns. Both methods get the job done.